Subsequent deposits vary dependent on deposit amount. There’s not a bandaged ‘mummy’ in site when you land at Mummies Bingo that was slightly disappointing. Instead you are greeted with your stereotypical homemaker cartoon mummy. 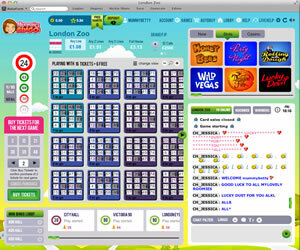 The site opened to players at the back end of August 2014 and offers a great variety of bingo games powered by the Cozy Games software as part of the Live Bingo Network (LBN). We were pleasantly surprised to find that at registration to Mummies Bingo we were not faced with the usual bind of trying to find an email address that wasn’t already registered with LBN. An address that we have used at several sites worked fine and with a quick click of a link in the welcome email, the bonus was added instantly to our new account. It is worth noting though that financial details are required at registration but that said, no money will be taken unless you choose to deposit and take advantage of the cash match deals the site has to offer. It took just a few minutes to be ready to play and as soon as the account was validated we were taken to the player area. It is here that you can see the games on offer from Mummies Bingo – from the bingo to the slots, free bets and much more besides. In this section you have an array of options too. You can view a selection of reports, access the help desk, deposit and withdraw and make amendments to your account if required. It is here that you will also see all the details about the open bingo rooms available. The details shown help you to make an informed choice of room, one that suits your gaming requirements and your budget and boy, are there a lot of rooms to choose from. Three different type of bingo game where available at the time of compiling our review (75, 80 and 90 ball), but we also know that Cozy is able to offer 30 ball speed games too. It may just be that Mummies Bingo only offer it at certain times of the day. Upon entering a room you will feel right at home if you have visited other brands using this software. The layout, purchasing options and chat are just the same as at other sites. 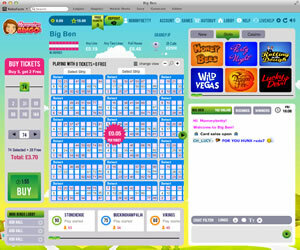 Purchasing options to the left, tickets and game details in the centre and chat and instant games to the right. Sadly Mummies Bingo is also home to the over zealous, smiley happy hosts from Cozy Games but on the plus side, there doesn’t appear to be purchasing restrictions on tickets that we have come across at other brands. Overall the site is OK but then we have never been big Cozy Games fans. There have been plenty of changes like the lower minimum withdrawal from LBN but there are still some hurdles for them to jump before we are ever really going to thumbs up a brand from this network and software combination. With nothing to make it stand out from the crowd Mummies is just another of the same that we have seen time and time again. That said, the gaming experience isn’t a bad one, we certainly had fun spending our free money. 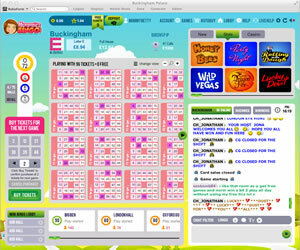 There are several different bingo game variants available at this site. At the time of the room there were multiple rooms open all offering 75, 80 or 90 ball games. 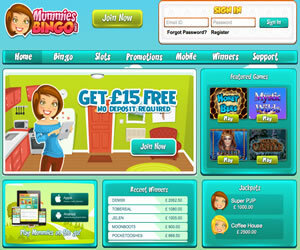 In addition to this Mummies Bingo have a great selection of instant win slot and casino style games to choose from at their site. 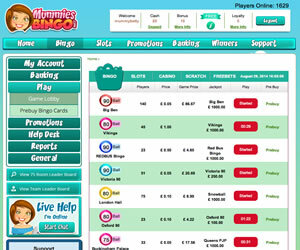 Wagering requirements on deposits vary at Mummies Bingo dependent on the games that you are playing. For bingo the wagering requirement if bonus cash accepted is 4x the amount of deposit + bonus received or for any other game besides bingo it is 10x the amount of deposit + bonus received. You should note that you can only withdraw a maximum of £300 per week from Mummies Bingo.